The Heritage High School Interact Club Officers will facilitate our club meeting this week. It's a meeting you don't want to miss. In 2002, the Rotary Club of Leesburg decided to sponsor an Interact Club at Heritage High School, which opened in August of that same year. The Heritage High School Interact Club was officially chartered in December of 2003 under the leadership of Rotary Club of Leesburg President Jake Jacobson and faculty adviser Scott Ferguson. Since its founding, the HHS Interact Club has embodied the motto “service above self” by engaging the student body in a variety of local and international service projects. Today, the club meets once a week and boasts 85 active members, making it the largest service club at Heritage High School. Interact is routinely asked to represent Heritage in the community and cited by the school administration as an example of outstanding student leadership and service. Popular service activities for the Interact Club include participating in Wreaths Across America, donating food for Backpack Buddies and Loudoun Interfaith Relief, and partnering with its feeder schools for service and fundraising events. Interact also partners with the Rotary Club of Leesburg in the annual Halloween parade, the annual Croquet Tournament, rummage sale clean-up, and other events. 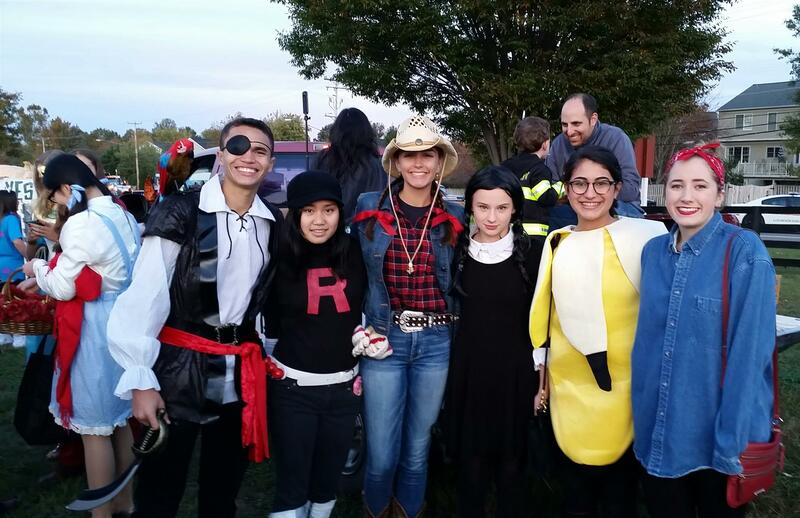 Pictured: HHS Interact Club Officers at the 2016 Leesburg Halloween Parade.